I’m not lying. I timed myself. I started cooking at 7:15 and I was done by 7:47. For the sticklers out there that is 32 minutes but it was close enough that I rounded. There was an additional five-ish minutes where I got ingredients together and set them on the counter next to my cooktop. I’ll rave about it once I give you the details so you don’t have to keep scrolling when you’re hungry. usually 8 oz for 2-3 people. Turn your burner to medium and add 1-2 Tbs of butter or olive oil. While this is melting chop your onion. Once the butter is bubbly and melted add onions and cook until translucent and fragrant. I usually let them go for about 2-3 minutes until my kitchen smells like onion. Then add garlic and cook for another 1-2 minutes. Add basil, oregano, and salt and pepper to the pan and stir to combine. If using dried spices this will help to wake them up. If using fresh, keep a little of the basil to sprinkle on top of the finished dish. If using both get creative! Fill your sauce pan with water and turn on the burner underneath. If you added salt to your sauce I would not add salt to the water. It’s just too much. Once the spices have warmed open can or jar of tomatoes and add to the pan. Use a spatula to smash them into small pieces. I like them very small, almost nonexistent so I do this several times. 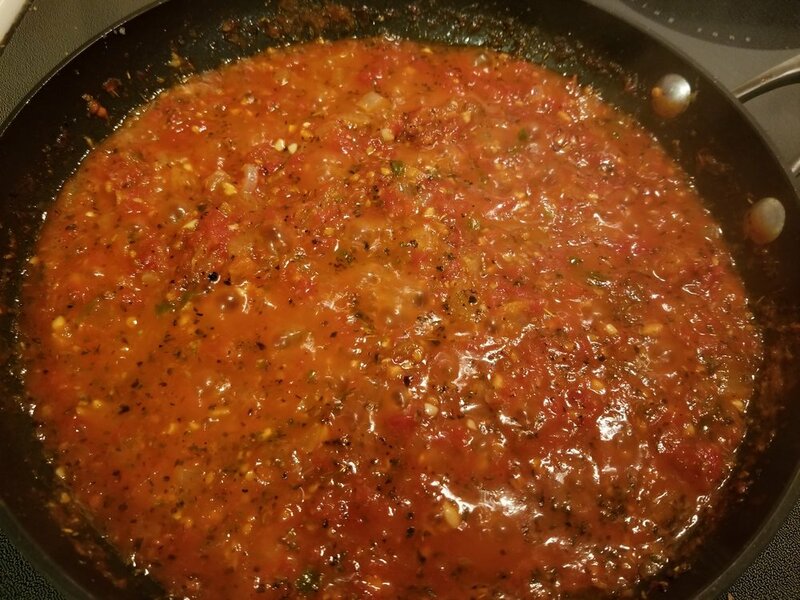 Keep sauce bubbling until it reaches the desired consistency. I usually just let it simmer until my noodles are done, about 15-20 minutes. Once the water in your sauce pan is boiling add noodles and stir often. Cook until al dente, which will vary depending on which noodle you choose and your elevation and the temperature and how the noodles are feeling at the time… Just check them periodically. It usually takes between 7-12 minutes for most. When noodles are finished drain remaining water off by dumping noodles into a strainer. Immediately add 1 Tbs olive oil or butter to the pan. Add the noodles back to the pan and stir to coat evenly. If needed add additional oil. Serving suggestion: Place a large spoonful of noodles into a bowl and sprinkle with Parmesan cheese. Then top with 1-2 Tbs of sauce and fresh, chopped basil. My sister introduced this recipe to our family. I think she got it from a cooking class or something but it was an instant hit. My mom grows hundreds of tomatoes every year and then bottles them by the hundreds as well. I never appreciated that effort like I should have. 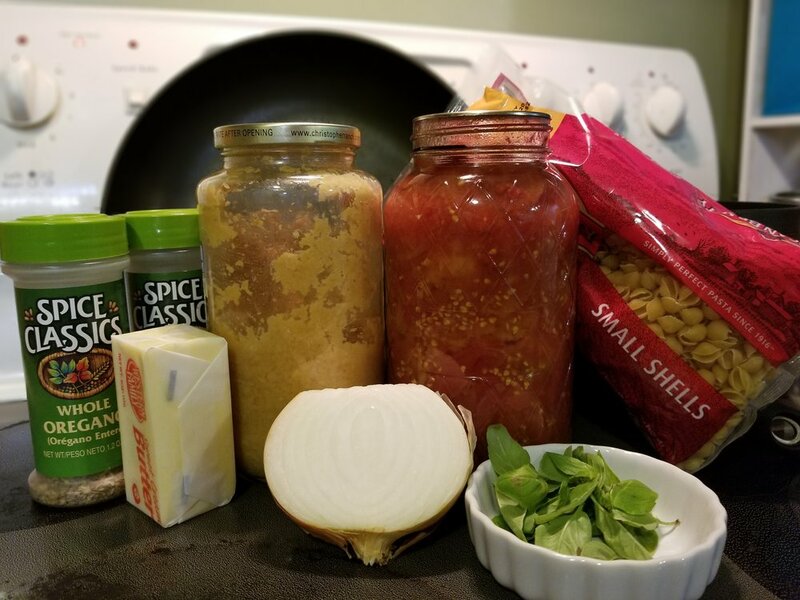 I have fresh tomatoes for spaghetti sauce, marinara sauce, soups, stews… This one took off because we always seemed to have all the ingredients on hand, it feeds lots and takes 30 minutes to make. And it’s so easy to customize. Add chicken for a main dish. Add zoodles to make it low carb. Add cheese to make it richer. It’s always good! Now for some tips and pics. I try to time my pasta and sauce so that they will be done at the same time. You don’t have to multi task though. You can cook the sauce first and then turn it on low and cover with a lid. Just keep it warm until your pasta is done. Tomatoes have lots of liquid in them so when you first dump them into the pan your sauce looks more like soup. See the color and texture change? If you want it thin that’s great. I usually let it simmer to get some of the liquid evaporated because I like it to stick to the noodles. Cooking longer also deepens the flavor of the tomatoes. They taste more like marinara and less like fresh off the vine. If that makes sense. Just keep stirring and looking at the sauce until it looks good to you. I usually add some Italian seasoning as well as the basil and oregano. It’s the flavor that I like. I also use fresh when I have them but I don’t go buy them if I don’t. I have all of these spices in bulk in my pantry and I use them all winter long. I use a combination of butter and olive oil. Butter usually goes into the pan with the sauce but I use Olive oil on the noodles to keep them separate and not sticky. I like the flavor of butter better because it has the lovely dairy taste that just makes it rich and well developed. 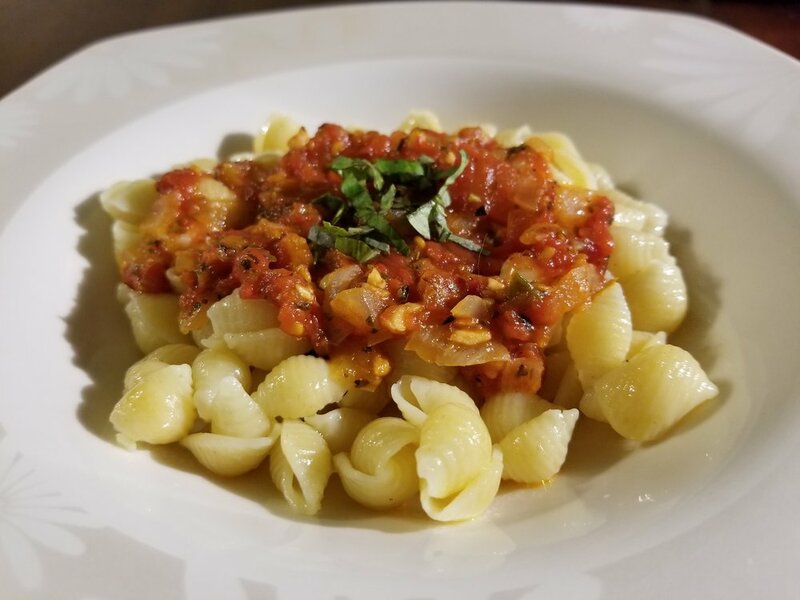 As far as noodles go I like ones that will hold a lot of the sauce to them such as the shells or penne. It’s a chunky sauce and with the olive oil on the noodles not much sticks to them. I also like to customize it every time so it keeps it interesting. Sometimes I add chicken or meatballs to make it more of a main dish or I keep it plain so that I can go meatless for a meal. Sometimes I will melt some cheese on the noodles to give it a different flavor and add some protein without adding meat as well. It’s totally customizable to whatever you feel like having that day. And the ingredients are all pretty standard pantry/on hand items that don’t go bad so you can keep them on hand at all times. It’s great for entertaining because it looks pretty and is easy to expand to feed a whole crew or just an intimate group with the original recipe. Honestly that is about it. Now I need to go make this for dinner again. I’m hungry!